To popularise Ham Radio in western India two events were conducted back to back recently by Rajesh Vagadia VU2EXP Regional Coordinator AMSAT-INDIA. 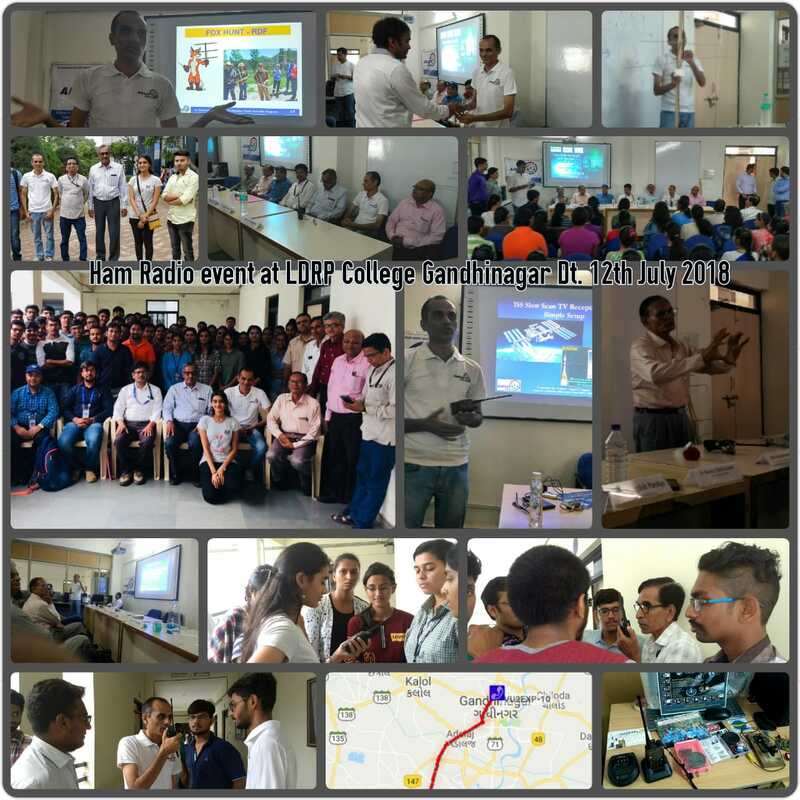 ‘Ham Radio for GenX’ – Full day workshop with demo was conducted at LDRP College Gandhinagar (Gujarat – India) on 12th July 2018. More than 70 EC students + faculties participated in this awareness event. GIAR, LDRP, IEEE, ISRO & AMSAT-INDIA. From GIAR, OM Pravinbhai Valera VU2CPV (Joint Secretary) & OM Jagdishbhai Pandya VU2JGI (General Secretary) blessed us with their kind presence. Presentation on ‘Antennas for Space Application’ was conducted by Dr. Ramesh Kumar Gupta (SAC-ISRO). Ham Radio history & Introductory session was nicely conducted by Jagdishbhai Pandya VU2JGI with several interesting examples. Thereafter Rajesh Vagadia VU2EXP gave good overview on Satellite Communication, Digital Communication, APRS, RDF, IOTA, SSTV & RTL-SDR etc. technology. Live demo of SSTV was conducted which was very much enjoyed by the students & faculties. VHF demo with mock drill was simulated by VU2EXP Rajesh, VU2JGI Jagdishbhai, VU3IKI Ke Ke, VU3EXP Sakshi & team. QSL Cards, Awards, etc stuff was displayed for the knowledge of the students. We also got nice support from other fellow hams incl. VU3DVA Deepakbhai, VU3GLY Priyesh, VU3DSJ Dipakbhai, SWL Abhigna etc team. We had guest presence of Dr Narendra Chauhan Sir (IPR) & Prof. N. N. Jani Sir in the event. I am thankful to Prof. Dave Sir (HOD – EC), Prof. Mendhe Sir (EC), Mr. Nilesh Makwana (IEEE) to nicely coordinate & support the event. Program concluded in hope to have good number of future hams from the Institute. 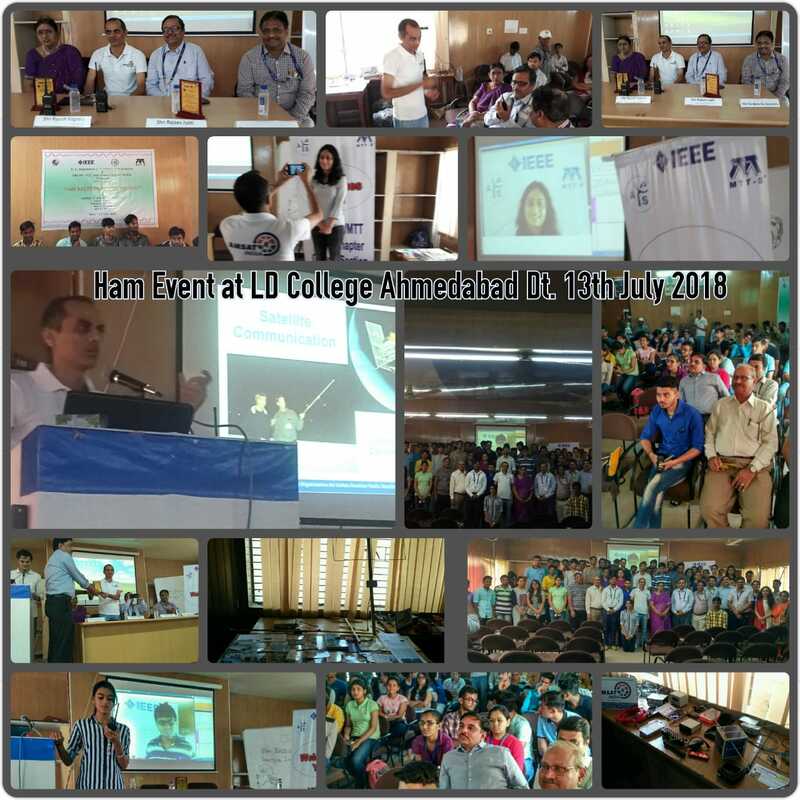 ‘Ham Radio Practical Insight’ titled workshop was conducted at LD College Ahmedabad (Gujarat – India) on 13th July 2018 in afternoon session. More than 65 EC students + faculties participated. Dignitaries from IEEE, ISRO, LD & AMSAT-INDIA inaugurated the workshop. It was our great pleasure to have chief guest presence of Shri Rajeev Jyoti Sir (Dy. Director SAC – ISRO) & Chair (IEEE) Gujarat chapter in this Ham Radio Workshop. Rajesh Vagadia VU2EXP explained the latest technology/modes ham world uses & gave quick practical Demos for chief guest. Demo includes CW, Text, Image & Voice transmission/reception with simple VHF Radio sets. The simple experiment techniques used were described. Students were surprised to learn the potential of Amateur Radio & experts appreciate such public demos. We got nice support from team members VU3EXP Sakshi, VU2UTZ Dinyarji, VU3PMT Mahendrabhai, VU3GLY Priyesh, SWL Ketanbhai during demo & whole event. Thereafter detailed presentation was given on interesting ham events, digital communication, Satellite Communication, ARISS program, ASOC licencing procedure, APRS, SSTV witth RTL-SSDR etc. Session remain very interactive with lots of queries which were answered very well by VU2EXP. Also mini Ham Radio exhibition was keenly enjoyed by the audience. I am thankful to Prof. Usha Madam (HOD – EC), Prof. Arun Sir (EC), Mr. Nilesh Makwana (IEEE) to nicely coordinate & support the event. Small spark of Ham Radio was ignited, hope we get good number of Hams from the participants, in the future.